The Foothill Gold Line Construction Authority has released a plan to build the Gold Line Extension to Montclair in two phases due to the current trend in rising construction costs. 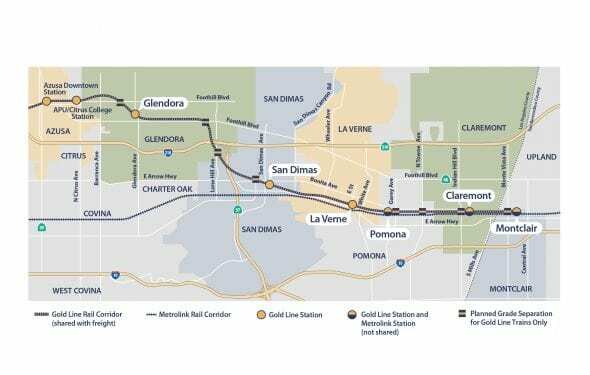 The plan would build the first phase of Gold Line to La Verne at least two years ahead of schedule — i.e. 2024 — with new stations in Glendora, San Dimas and La Verne. The original plan was to build the entire extension from Azusa to Montclair as one project with stations also in Pomona, Claremont and Montclair and a project opening date of 2027 and budget of about $1.5 billion. Construction bids received were substantially more than the project’s cost estimates, said the Authority. This reflects an ongoing upward trend in construction costs in many industries, transportation included, due to a vibrant local and national economy. The Construction Authority is the agency created by the state to build the project, which will be turned over to Metro to operate once it’s complete. The project is funded largely by Metro’s Measure M sales tax and state transportation funds. The Construction Authority said that breaking up the project into two phases would allow it to get 70 percent of the project open as quickly as possible at current costs. The Construction Authority is also asking its Board of Directors to raise the project’s budget by $570 million to about $2.1 billion. The Authority will have to seek the additional funding needed to build the remaining four miles of the line to Montclair. The first eight-mile section is the easier part of the project to build. East of La Verne the Gold Line tracks will be adjacent to both active Metrolink and freight tracks that will have to be moved to accommodate the new light rail line, an expensive and challenging task. The new plan is subject to environmental approval, according to the Construction Authority. With all the stuff we are building now it is no surprise that construction costs have gone up. Temporarily ending it at La Verne would allow proper time be taken to coordinate with Metrolink and allow for a giant parking lot at the end (the Fairplex parking lot) to be temporarily rented for park and ride, which seems to be everyone’s concern now. These projects assume the commuters are going to Downtown LA. It doesn’t do much for local or regional commuters. One stop each for San Dimas and La Verne? They need to consider North-South routes to capture more passengers coming from different areas. I’ll just keep using my car, thank you. Has San Bernardino County committed any funds toward their share of construction costs for the second phase to Montclair? Does this mean a re-bid? No problem with building to La Verne. Have you thought about working with Metrolink to have them build a temporary platform so that Metrolink trains could stop in La Verne and have passengers transfer to Metro Gold Line?